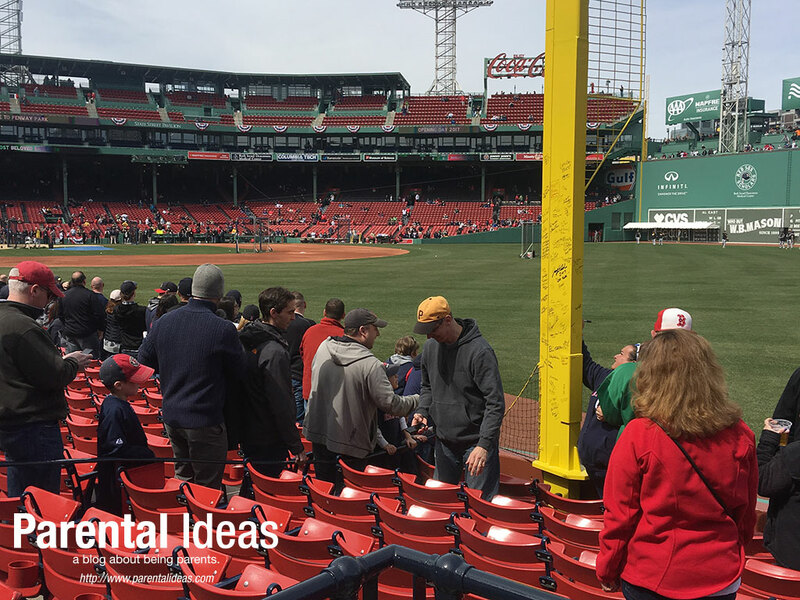 Parental Ideas: New things at Fenway for 2017! New things at Fenway for 2017! I'm excited to be able to tell you all about the new things when you come to Fenway Park to catch a Sox game this year! You will notice new concession offerings, a new Pesky Pole, Virtual Reality Batting Cage, a Right Field Terrace Video Board (where Cumby's sign used to be), a larger dugout and more items! 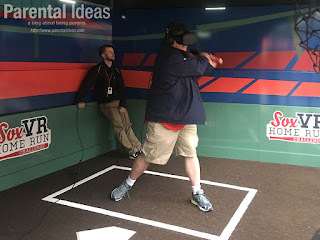 I had a chance to try the new VR Batting Cage and it's pretty amazing what they have been able to do with this technology. The club will expand the virtual reality station in the Kids Concourse by introducing a VR batting cage experience where fans can feel what it’s like to take swings against Major League players at Fenway Park. The club first introduced VR during the 2016 season with the Virtual Dugout station that shows behind-the-scenes, 360 videos with players. The VR Dugout will return in 2017 with new content. Aramark, Fenway Park’s concessionaire, will introduce new and locally inspired items to the Fenway Park concession menu in 2017. Regina Pizzeria is now the official pizzeria of the Boston Red Sox and will be serving their renowned pizza at the ballpark, and Strega’s new creation, a baseball-inspired meatball-in-a-bread-cone will be available at pizza stands throughout the concourses. Yankee Lobster, the popular seafood restaurant in the Seaport neighborhood of Boston, will showcase their signature New England lobster rolls and other new lobster-themed offerings at the Fish Shack on Yawkey Way, and at seasonal locations throughout the ballpark. Fans can also try new signature items on Yawkey Way from Savenor’s Market, Fenway Park’s official butcher and meat supplier. The Cambridge-based company will offer a short-rib grilled cheese sandwich and will also feature turkey and steak tip sandwiches at other Savenor’s locations throughout the ballpark. Fenway Park’s Big Concourse will feature several new items this season. The area now includes a new build-your-own-salad and fruit bar in the lower level featuring select produce from Fenway Farms, and new kids meals will be served in the Kids Concourse area in Wally and Tessie commemorative brown lunch bags. 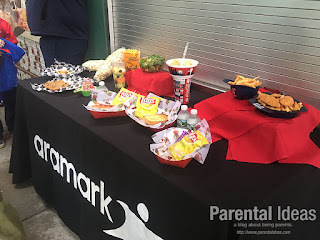 The kids meals offer a choice of a mini kids hot dog, a peanut butter and jelly sandwich, or a grilled cheese, and are served with Lay’s chips and a mini Poland Spring water. Aramark will continue its test kitchen concept by introducing monthly rotating items at a stand in the Big Concourse located across from the Champions Club. Featured items for the month of April include lobster melts with steamed lobster, melted Muenster cheese, and sliced tomatoes; or surf & turf kebabs with skewered shrimp and/or marinated steak tips. Fans with a sweet tooth will have more dessert options to choose from in 2017. In addition to the popular Hood soft serve ice cream locations throughout the ballpark, the newly added “Cookies n’ Creamery” stands will be located at gates A and C offering ice cream sundaes, creamsicles, ice cream sandwiches, hard ice cream, and freshly baked warm cookies. The popular Tasty Burger restaurant added a third location at Fenway Park in the Right Field Concourse to complement existing stands at the 3rd Base Deck and at Gate C. And to commemorate the 50th anniversary of the 1967 Impossible Dream team, Aramark will feature five different souvenir cups throughout the season celebrating memorable moments from that special year for fans to collect throughout 2017. The Right Field Foul Pole, “Pesky Pole,” underwent extensive structural repairs this offseason to reinforce areas that were impacted by general wear and tear over the years. A new video board in right field, installed by ANC, has replaced the Cumberland Farms sign that previously occupied that space. The new 16mm Mitsubishi Diamond Vision LED display measures 14’ high by 46’ wide and will provide improved access to game information, replays, and video content, particularly for those seated on the Green Monster and in Bleacher sections where viewing the main video board is challenging. 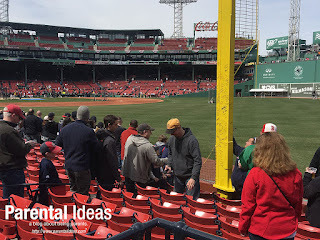 NOTE: As a Red Sox Parent, I was invited to a game at the beginning of the season to see all of the new improvements to Fenway Park and learn about the new initiatives for kids and families! All opinions are my own.